South Korea’s National Pension Service (NPS) will up voice in corporate governance in upcoming shareholders` meeting of Hanjin KAL, the holding entity of Hanjin Group companies including Korean Air, but won’t actively seek changes in the management such as replacement of scandal-ridden chairman Cho Yang-ho and others. The NPS will “proactively” exercise the voting right in management affairs of Hanjin KAL but in “restricted” manner and won’t meddle in affairs of Korean Air which delivered best-ever revenue last year. The dual decision was made Friday at the fund’s top policy-making management committee chaired by the health and welfare minister under stronger responsibilities for the top institutional investor under the stewardship code adopted in July last year. The 14th largest conglomerate has been holding its breath on possible reversal of the final decision despite NPS’s outside advisory board on stewardship recommendation against management meddling in Hanjin KAL and Korean Air after President Moon Jae-in last week commanded stronger oversight role from the pension fund to rein in excesses and wrongdoings of large conglomerates. NPS is the world’s third largest fund with 635 trillion won ($568 billion) assets under its management. It holds sizable stakes in most household Korean stocks and was relied mostly on as a white knight for the Korean Inc. against outside hedge funds. The fund is the second largest shareholder of Korean Air with 12.45 percent. 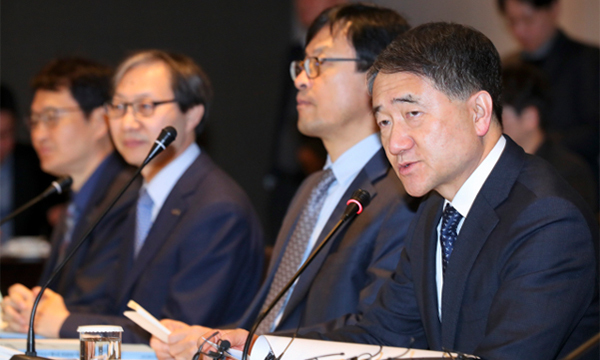 It owns 7.34 percent of Hanjin KAL, the third largest shareholder after Chairman Cho Yang-ho and family members (28.93 percent) and Korean activist fund KCGI (10.71 percent) that recently increased stake to keep oversight on the conglomerate. It demanded a new auditor and outside directors on the board. It also told the management that it opposes to the extension of Hanjin KAL CEO Seok Tae-soo whose term ends in March. Under its latest decision, NPS won’t be siding with the activist fund in demanding changes on the board. It will instead follow the capital law in voicing stronger responsibilities by asking Hanjin KAL to include an article in its corporate mandate to remove a board member if he or she is convicted of criminal charges. Shares of Hanjin KAL closed Friday 2.17 percent higher at 28,300 won, whereas those of Korean Air lost 1.79 percent to 35,750 won.